To make her toile, Renée Green combined bucolic scenes typical of eighteenth-century upholstery fabric with violent scenes of enslavement and uprisings. 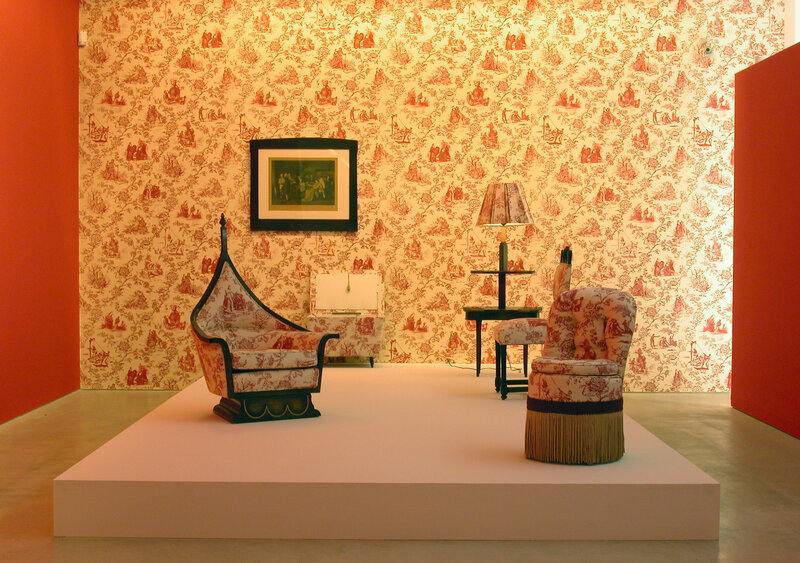 Using this fabric, she has constructed installations reminiscent of museum period rooms, with chairs, settees, drapes, and wallpaper, deploying these historical tropes and forms to tell other, often repressed histories. "Mise-en-Scène: Commemorative Toile." Take It or Leave It: Institution, Image, Ideology Digital Archive. Los Angeles: Hammer Museum, 2017. https://​hammer.ucla.edu/​take-it-or-leave-it/​art/​mise-en-scene-commemorative-toile/​.